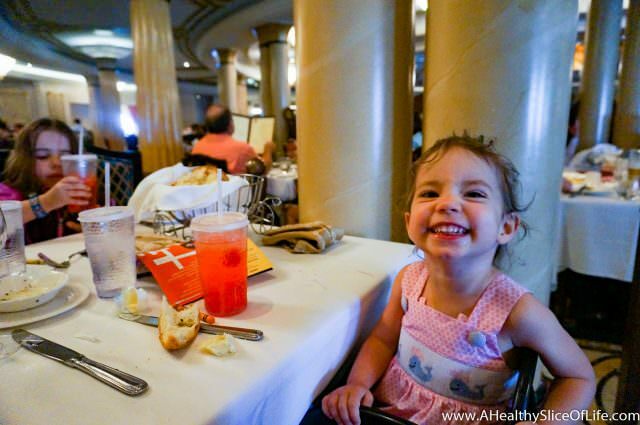 This post is a compilation of my best tips for those considering going on a Disney cruise with a toddler. You can see details of our Disney Dream 3 night cruise part 1 here, part 2 here and what to expect from the food here. 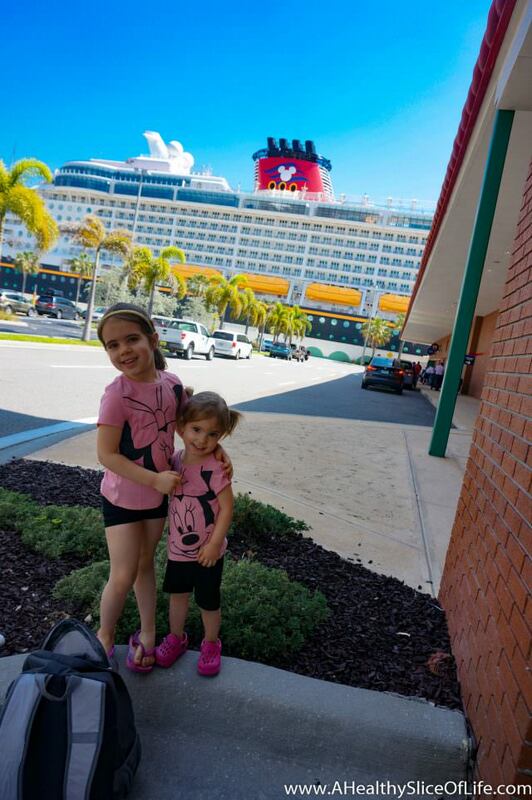 We hadn’t planned on going on a Disney cruise, but with Hailey at 4 1/2 and Kaitlyn at almost 2, I was beginning to feel the Disney itch. Still, I thought the parks might be a bit much for us since we are planning on doing Disney once and going all out versus an every year attempt. 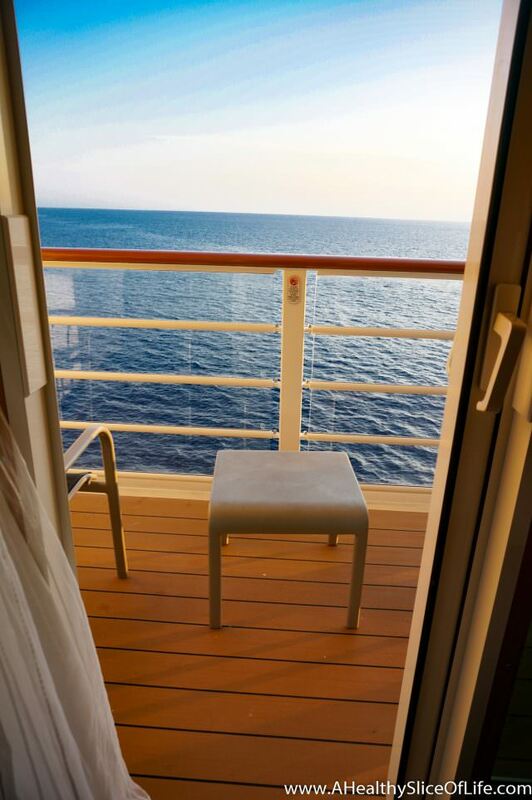 We heard about the cruises, then, it was almost like we couldn’t stop hearing about them. Everyone we talked to raved about the cruise. After a few Disney cruise youtube videos, we were sold. Still, everyone we knew who went had slightly older kids. With Kaitlyn being just shy of 2 and still in diapers for the most part, I wasn’t quite sure what to expect. So, I am writing this post with the framework of everything I wish I’d known before our cruise with a toddler. Pick an early time to board. A few weeks before your trip, you will be sent login information to check in early online. Do it as soon as you can. Through this login you an choose your time to board the boat, alter your dining time, make reservations for the nursery and everything else, etc. We chose 11:30 to board the boat because we were unsure of our drive time. If I did it again, I would choose 10:30 or 11:00. When traveling with a toddler, this provides time to get on board, get princess tickets at guest services, eat lunch, then go down for a nap right at 1:30 when you are allowed into your room. The safety drill at 4:00 is mandatory and you can not nap through it. There is a loud announcement and you are required to leave your room, but if you nap at 1:30/2, you will still get in adequate sleep before the drill. Bring the Ergo. Strollers are allowed, but in my opinion, are cumbersome. I saw people struggle to get through the lines with one and then the only option is to take the elevator. We opted for the stairs most of the time because they are right next to the elevator, always less crowded and it was nice to move a little with all the food and drinks we were consuming. I could easily put Kaitlyn on my back in the Ergo and move swiftly through the crowds. Plus, I could stick a diaper, wipes and any other item I needed in the Ergo pocket. Children younger than 3 are not allowed in the kids club. This is a bit of a bummer, but understandable. 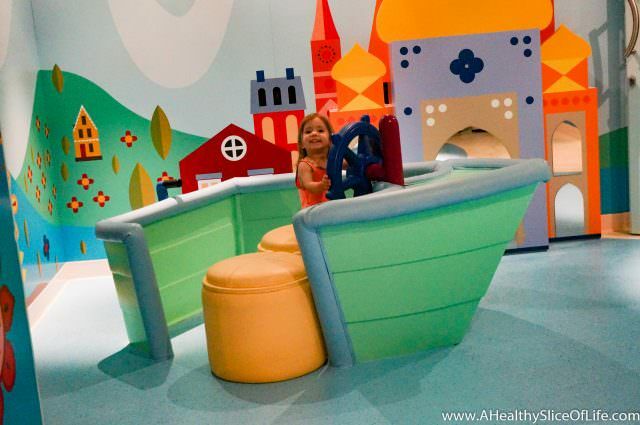 There is a great option for children 6 months-3 years old though- the It’s a Small World Nursery. The nursery is an additional cost of $9 an hour. They will feed, change and play with your child. Your child can even nap or go down for the night in the nursery, as they are open until midnight or later. We never had a problem just dropping her off, but I have heard it can get busy and space is limited so reservations are encouraged. You can make these when you check in online. Here is a post with more pictures. Request a pack and play. You can do this when you book the cruise and it’s wonderful. I debated bringing out own because I’m weird about cleanliness, but the pack and plays they provided were in great condition and very clean. Plus, with the pack and play they also provide a diaper genie with liner and everything at no extra charge! Children that are not potty trained are not allowed in the pools. Kind of a bummer, yes, but there is so many other things to do to stay busy. First of all, the pools are rather small to begin with, so it’s not like you could really go swimming. 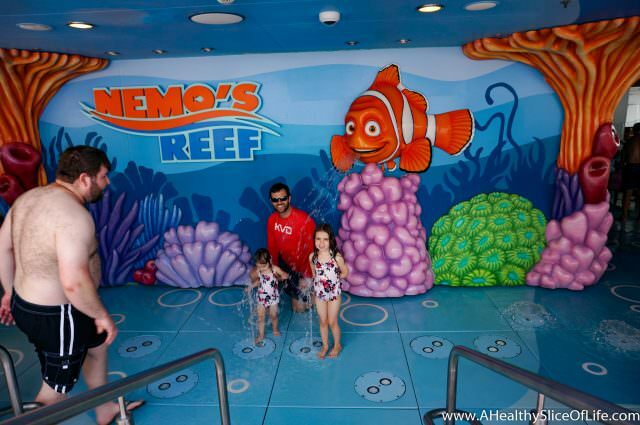 Instead, take advantage of Nemo’s Reef splash pad on deck 11. It is large and offers so many different kinds of squirting and splashing that your toddler will not miss the pools. There is even a water slide, just their size. Embrace ahead of time that you won’t be able to do it all. You will receive a Navigator newsletter each morning with all the activities of the day. It can feel overwhelming. Do you skip nap time to go see Mickey? Do you need to push it to see a show? 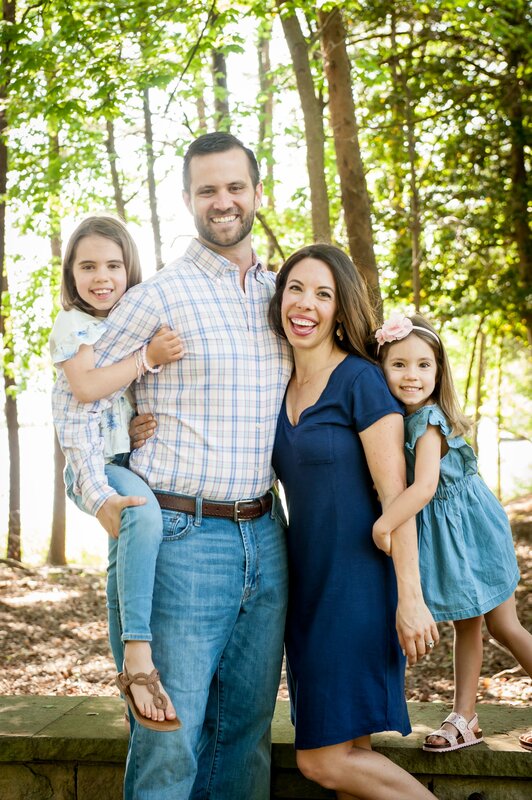 While some things were with switching around our schedule for, I knew that the experience of just being away from home and on a boat was pretty exciting to Kaitlyn already. Knowing my kids do much better when the get adequate sleep, I went in knowing we wouldn’t be able to do it all. With that mindset, I actually ended up really pleased at everything we did fit it and know there is still more to do if we ever go again. Stay on the ship at port. We didn’t get off the boat in Nassau. Our girls weren’t old enough to do the excursions anyway, plus wandering around a town (with questionable safety) didn’t seem like it would appeal to them. Instead, we stayed on the boat and enjoyed a smaller crowd of people for the spashpad, lunch, water slides and getting around in general. Pack waters. I packed a 24-pack of bottled waters in our luggage and checked it, so I didn’t have to carry it. It was delivered to our room with our luggage and a lifesaver. On board they were selling bottled waters- 12 bottles for $20. It was great having fresh water to grab in room to fill up night time water cups (remember to bring your own sippy cup with a lid too if you want to bring a drink back to the room or carry it around the boat with you). Dinners are still long, consider bringing toys or using the nursery. The servers are speedy and even bring kids food out first, but still, toddlers aren’t known for wanting to sit still for long. The restaurants have a highchair and crayons waiting, but it is still a good idea to bring a few small toys OR put them in the nursery to have dinner there. I think my personal favorite though is the quick switch. Have them bring your toddler’s food with your appetizer, then after your toddler eats, one parent can go drop her off in the nursery then return to finish your meal together in a more relaxed environment. Bring a princess dress. They are for sale on the boat, but obviously very marked up. Little girls are wandering around in dresses everywhere and our girls begged to wear their dresses all the time. You don’t need anything super fancy, Amazon has some great options, but it is definitely worth bringing one with you. Don’t forget a hat. I was surprised that we weren’t actually in the sun that much, but when we went onto Castaway Cay, there wasn’t much shade, so a hat is necessary. Spurge for a room with a veranda. Our girls napped every day for about 2 hours. We were able to sit on the balcony, watch the ocean and islands and sip a cold adult beverage (remember, you can bring your own beer and the rooms have a small fridge to keep it cold!). I honestly don’t know what we would have done without it. Pack diapers, wipes and a change of clothes in your carry on. To reiterate, your checked bags are not promised to be at your room until 5:00, so make sure you have everything you need packed in your carry on. If you are going to put your child down for a nap, this could also mean a white noise machine, lovey, sippy cup, change of clothes, etc. Get the early dining option. The first dining service is at 5:45 pm. The second is at 8:30 pm. I can’t even imagine doing 8:30 with a toddler, but maybe you are more brave than I. Check out the toddler/baby-specific activities in the daily navigator. Disney maps out specific activities for babies and toddlers each day. We never made it to the toddler play times, but they exist. I also saw them setting up for the Diaper Dash in the main lobby. The crawling race looked adorable and hilarious! Friends that have been on a Disney cruise with a toddler, what is your best tip? And if you are considering one, leave your question below and I’ll answer! These tips are absolutely amazing! Pinned and ready for if/when we do a Disney cruise. What a fun trip! Love these posts! Did you at any time feel seasick? I am really prone to it so I shy away from any kind of water trips! Susan I am the same way! My Father-In-Law gifted my husband and I an Alaskan Cruise for our honeymoon and I was freaked out. I get terrible car sickness and get dizzy super easily and hate carnival rides etc etc. I went to the pharmacy and bought little Dramamine patches for behind my ears. Those made me nervous too because I didn’t want to feel sleepy but I eventually decided that sleepy was better than getting sick for 7 days. Anyway, they helped a lot! I never felt sleepy and only felt a bit “ugh” on the two days we were out at open sea. Great question! I should have addressed it. I only have our trip to speak from, but our boat was so ridiculously steady that I wouldn’t even know we were on the ocean unless I looked outside. The Disney fleet has fins that go out on the sides of the ship under water that help steady it. I did bring my sea band bracelet, but ended up taking it off after the first day. I hear they also have complimentary seasick meds at guest services if you need them but I really don’t see it being a problem unless you hit really rough weather. I am so SOLD on this after your posts! However, now I’m thinking maybe I should wait until Cameron is 3 so they can do Kids Club together at times, and so the potty training / pool issue doesn’t come into play. We were going to do Disney World but agh. It will be a tough choice! But I am sold on doing it eventually. Yes, I would have loved it K and H could have been in kids club together, so I definitely think it’s worth waiting. Plus at 3, they can push a little longer and maybe even through nap! Disney on my list now- I just am not quite sure as to when exactly! Maybe when Kaitlyn reaches 38inches, or right before she turns 3, then she is free! Brittany — i loved these recaps. It totally makes me excited for the years to come! Such a great time for your family. Thank you so much for this! Especially the bottled water tip! We are taking my daughter for her 4th birthday & my son will be 15 mos. so glad we got a veranda cabin too! This is one of the most cutest and knowledgeable most I have come across, I am bookmarking it right away and the pictures are so beautiful. May you have lots and lots of many more wonderful years with your family ahead. I REALLY want to do this cruise for the same reason as you- we are only doing Disney once and I want them to be old enough to remember it (right now mine are 3 and 1.5). However when I went to go price this out, it seems the cruise is just as expensive as Disney! 🙁 That was for a week-long cruise though, I will have to look into the shorter ones like this. It looks like SO much fun! Another question- did you guys use a travel agent or did you book yourselves? I know a lot of people uses agents for actual Disney but wasn’t sure if it was worth it or not to have one for the cruises. I don’t have much to compare the cost to (since we’ve never done Disney or other cruises), but I do know the Disney cruises are on the pricier side. We actually chose which week to go by comparing weekends and picking the cheapest. I think the week or so after our trip, the price went up by $1k! That is super helpful, thank you!! Another tip, bring ziploc sandwich/ quart size bags or small throw away containers to take fruit or other small snacks back to your room for the kids (or you). Yes there is room service also (dont for get to tip) but sometimes the food or snack your kid may love isn’t an option. Thanks for this post. My family and I are going on a cruise to celebrate my mom’s 60 birthday. My son will be 2 years and 10 months old, do you think he is have fun in the nursery or will it be geared too much to younger kids? Thanks!! We missed the open house so we weren’t able to take the tour and see it all, but I imagine he will be fine. I think the most important part is the involved staff, who will play games and entertain him. Disney really does a great job! Your posts about your Disney cruise experience literally just made me so happy. We’re about to go on one with our 3 and 1 year old and I’m so nervous. Seeing your pictures and reading your tips have been SO helpful. Thank you so much! You will have an AMAZING time!! Just pace yourself 🙂 There is so much to do and just walking around the ship is almost overwhelming for little ones- well, at least ours! Have a wonderful trip!! Thanks for such a great post! We will be going on our 3rd Disney cruise in November but our first with a 16 month old. So I have some questions about using the nursery. I’ve read that they would like you to provide food for the child (i.e. baby jarred food) but my son will probably not eat jarred food by then so do you know if they provide other types of food for the children that don’t eat baby food? Also how often did you end up using the nursery and were you able to drop off whenever you wanted? We are going on a seven day cruise and I have only booked the nursery for when we go to Palo. Toddlers can be so unpredictable so the idea of already scheduling nursery time 3 months ahead is giving me some anxiety! Thanks a lot! Yes, our cruise provided solid food (dinners and such) for kids in the nursery. They were very accommodating! We did book our reservations months in advance because we heard it could get booked up, as they have limited availability. In our circumstance though, there was ample open space and we ended up taking her at times we did not book ahead of time and it all worked out fine. I think it is smart to book it for your nicer dinner reservations, but otherwise I think you could just go with the flow. Ours was never booked solid (though we were on a shorter cruise) and it was nice being able to be flexible since we weren’t sure what the girls’ routines would look like once we were on the boat. Don’t forget to save room for souvenirs. Splurging is one thing, but you’ll most certainly want to bring home a few mementos, so make sure you have room in your luggage. Thanks for the tips!!!! May I ask if you brought car seats to use for the shore excursions? Thank you for posting. We cruised DCL in Dec 2015 with our, then, 5 year old. This time she will be 8 but our newest addition will be 2. I am a bit nervous about her being so small but Ilove love love everything you had to say and it has eased my nerves a whole lot. Thank you so much for all the tips!! We are thinking about taking our boy girl twins in January. They will be 23 months. Do you think 2 pack and plays would fit in the regular room with balcony; I have 2 options 249 sq ft or 290 sq. ft. Did you ever have a problem booking the nursery? I hear the nursery can fill up, but in our experience it was never a problem! I think you could fit two pack and plays, but it might be a snug fit. I’d call and ask because they might have some helpful tips (also, I’m pretty sure they provide pack and plays for you!) Have fun! !